This is the post I was excited to write, because it’s one of my favorite topics. I should know better than to hype it too much, as that’s usually a mistake. But no matter, tally ho, hip hip, here it is for better or worse. I’ve always loved dreaming, wishing, manifesting … anything along those lines. My favorite necklace which I wear most days says “dream” in Chinese. I love any form of wishing, first star of the night, wishbone, or a penny on the ground. If I am fortunate enough to find a penny on the ground, I need to pick it up. And if for some reason I feel silly picking it up, middle of a crowded grocery store as one example, it just kills me to walk past it relinquishing that chance at a new wish. In recent years I have gravitated toward the grown-up version of wishing, also known as manifesting. I just find the whole concept so interesting, and at this stage of my life, I am one hundred percent sure that it is effective and certainly does influence my life. It’s easier to see in hindsight. If I look back over my life, I can see the intricate webbing that wrapped around my desires that in time became my realities. There are many teachings that support my thinking, The Secret probably one of the most well-known books on the subject. What I find interesting is that I remember my power, and then forget it, and remember it, and forget it. I live mostly in the forgetful stage. I haven’t really figured out why that is. But no matter the reason, I am always delighted to remember that I do have power over my destiny both in terms of what I think and what I do. What I have come to believe is that the universe is always working with us to accomplish our dreams and goals, as long as … and this is an important part … we have pure intentions void of ill will, and that we are also willing to pitch in and work toward our goal. I also am convinced that at times, the universe will tweak our wishes a bit to fit what is available, but that usually I’m more than happy with the tweaks, and more times than not, it’s even better than what I tried to accomplish. I’ve come to count on that, and now offer that up when I am manifesting. We have learned about and studied more topics than I can even count at this point in our class, and we have spoken a great deal about intentions which go hand in hand with manifesting. One of my teammates posted a great blog about manifesting with the moon’s cycles http://ashleyneese.com/set-intentions-new-moon/. And being a landscaper, this appeals to me, since I’ve believed for years that we humans mimick nature in all ways. When Rick’s grandfather planted his garden, he planted by the phases of the moon. Why should our seeds be any different? Last week I saw the card going through some paperwork, and began to really look at it again. Now mind you, I placed this card on my desk at Virgin America when I had absolutely no intention of taking a yoga teacher training class. I liked yoga, no doubt, but hadn’t been practicing it for a few years by the time I chose to make this card something I would look at every day. The message simply resonated with me and I thought it would be nice to look at while I was working. 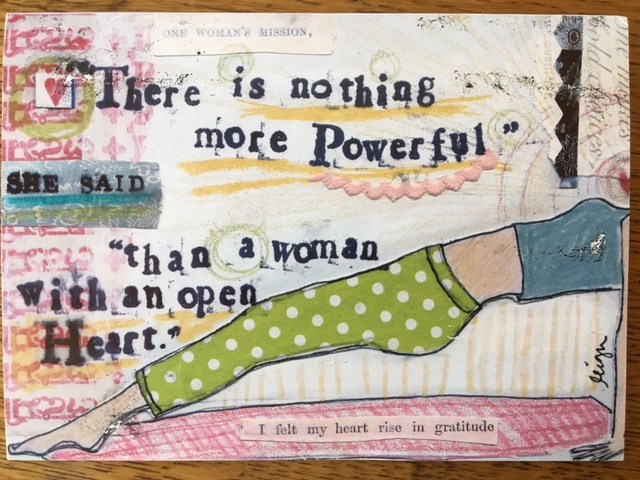 Reacquainting myself with the card last week, paying close attention to the small details, I had to laugh, a woman with a mission, an open heart, a voice and yoga. (Hmmmm, sounds vaguely like a woman taking a yoga teacher training class and sharing her experience in a blog.) I believe manifesting can be a conscious act, and I also believe it can be done by the part of ourselves that knows before we do what we need and want. I spent many hours at that desk doing something that did not bring joy to my heart. I enjoyed my coworkers, but listening to vast numbers of complaints can be a bit disheartening. I dreamed about the day I would get back to my passion of writing and returning to the pastimes I had enjoyed in the past, one of them being yoga. And here I am, writing a blog and studying yoga. That realization lights me up like that first star out every night I love to wish on. Manifesting is magical stuff. If you do it, you know what I’m talking about. If you don’t, try it. Be open and hopeful, and toss out the doubt. And above all, be patient. It’s a journey, and it takes time to realize our heart’s desires. There’s a line at the end of another of my favorite movies, “Under the Tuscan Sun” that I’ve always loved. I think of it often and it warms me from the inside out, as does the movie. “They say they built the train tracks over the Alps between Vienna and Venice before there was a train that could make the trip. They built it anyway. They knew one day the train would come.